The Golden LEAF BTEC building is located at 850 Oval Drive on NC State University's Centennial Campus. The main office for NC State's Biomanufacturing Training and Education Center is in Suite 195, and the office telephone number is 919-513-2000. The BioNetwork Capstone Center, part of the NC Community College System, occupies Suite 289 and its telephone number is 919-515-0232. Take Western Boulevard east towards NC State and then turn right onto Avent Ferry Road. At the second light, turn left onto Varsity Drive to enter Centennial Campus. Proceed until Varsity Drive ends at Partners Way, and turn left onto Partners Way. See the parking information and directions below. Take the Gorman Street exit (Exit 295) towards NC State. 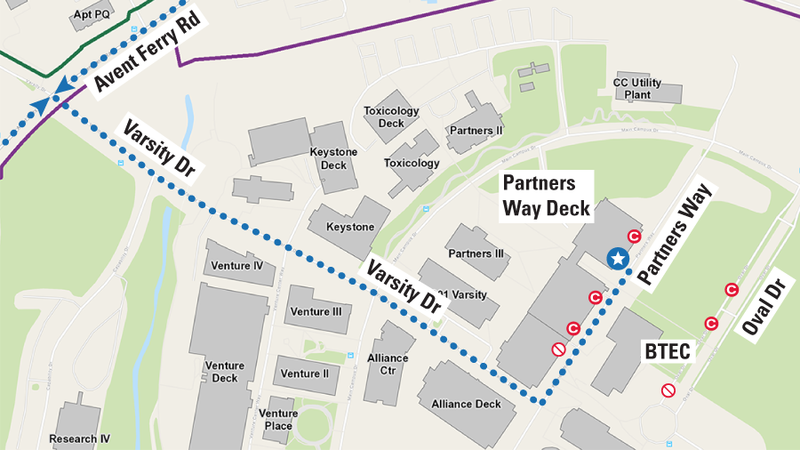 Turn right onto Avent Ferry Road, then turn right onto Varsity Drive to enter Centennial Campus. 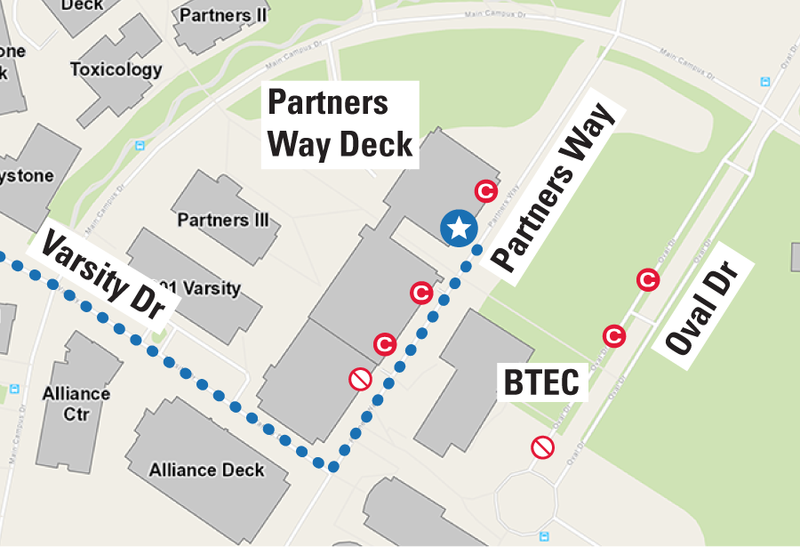 Proceed until Varsity Drive ends at Partners Way, and turn left onto Partners Way. See the parking information and directions below. Visitor parking is located in the Partners Way Parking Deck behind BTEC, on Partners Way. DO use the the public pay lot, which is indicated by the on the maps above and below. DO NOT enter the parking decks at any of the entrances indicated by the symbols; parking along Oval Drive is also prohibited. 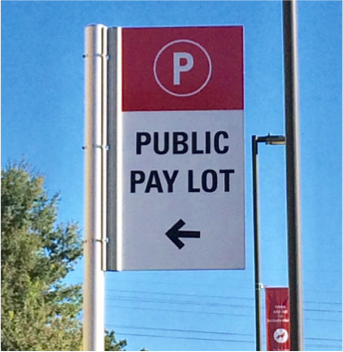 Look for the Public Pay Lot sign in front of the Partners Way Parking Deck. Park on the first level, which is designated as the pay lot. After parking, note your license plate number and proceed to the pay station (credit card or promo code only). All other levels of the parking garages behind BTEC are designated for employees or students. BTEC cannot validate parking and is not responsible for violations. 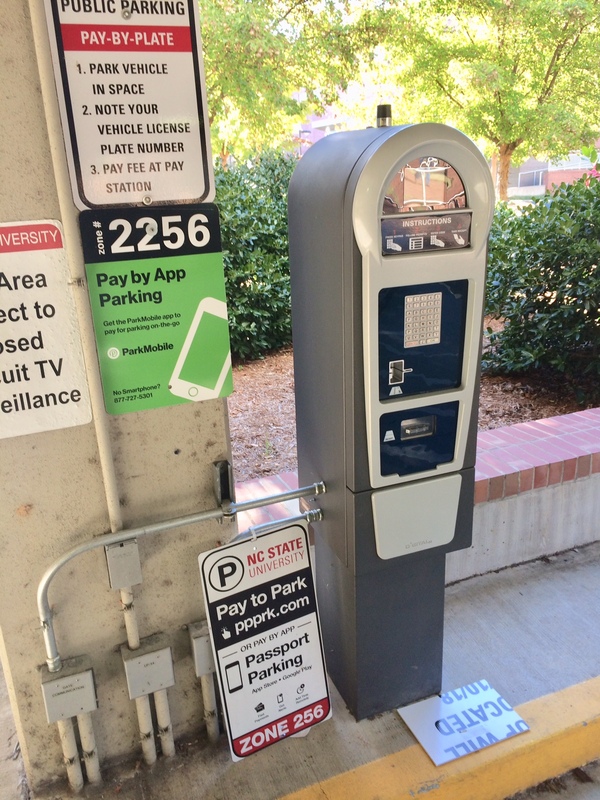 For more information about visitor parking, see the NCSU Transportation Visitor Parking web page. To locate any building on campus, visit the NC State Campus Map web page.